Comrades, the International Republican Socialist Network is proud to speak to those gathered today in commemoration of the great John MacLean through this statement. The IRSN was founded to increase awareness of, and support for, republican socialism as a distinct tendency within the Marxist tradition. We in the IRSN are ever mindful that it was Scotland that gave the world the two greatest activists of this tendency, Edinburgh’s James Connolly and John MacLean of Glasgow. The entity known as “Great Britain,” which ceases to exist without Scotland, is not a basis for working class unity; it is an anachronism, intended to benefit the English ruling class at the expense of the Scottish people. Yes, the Scottish workers are a part of the larger working class of the entire island of Britain, but so too are they as much a part of the working class of Europe and the world. Just as residing in a nation distinct from Palestine, Venezuela, Bolivia, Egypt, or Tunisia does not impede their capacity for solidarity with the workers of those nations; the creation of a Scottish republic will provide no impediment to solidarity with workers in England, Wales, or Ireland. To the sectarian Left who deride the struggle for Scottish independence with the canard that it threatens class unity, we ask, as Engels did in his day, if they would be prepared to move their head offices to Edinburgh to demonstrate their solidarity with Scottish workers and we denounce them, as Marx and Engels did, as English national chauvinists hiding behind a mask of internationalism. The Tories were not unearthed from their grave and restored to power on the basis of their electoral support in Scotland or Wales. For a century, working class organizations in Britain have stood on solid bases in Scotland and Wales and the forces of reaction have overwhelmed them from their bases in England. The fact that the SNP’s program stands to the left of Labour’s is a result of the sentiments of the electorate in Scotland being to the left of Labour’s electoral base in Britain as a whole. 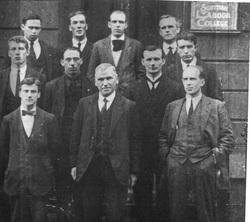 The creation of an independent Scottish republic will not only protect Scottish workers from those bastions of reaction to their south, however; by breaking apart the ancien regime of Britain, Scottish independence will mortally wound one of the world’s leading imperialist powers, thereby ultimately serving the interests of not only English workers, but working people throughout the world who suffer from the violence of British imperialism. We would be remiss and ill-serve the memory of either MacLean, or of Connolly, were we to only aver our support for Scottish independence at today’s commemoration. Republican socialism is founded on the inseparable unity of the struggle for national liberation with the struggle for socialism. Reflecting on the contribution of John MacLean to humanity today, let us not lose sight of that reality. The struggle for an independent Scottish republic must be a struggle for a Scottish Workers’ Republic, if it is to merit the effort of Scottish working people. The current international crisis of capitalism and the endless violence of imperialism in Libya, Afghanistan, Iraq and beyond should be more than enough to tell us that capitalism is now a fetid anachronism itself; one that offers no future to working people other than growing austerity and misery. So, as Connolly said to the Irish Citizen Army’s volunteers marching out during the Easter Rising, hang on to your guns because others fighting with you for independence have a different concept of the republic to be built, we say to you today, prepare for a struggle that will continue after Scottish independence has been won. Scotland will be truly independent until it has freed its economy of the tentacles of the imperialists; until Scotland’s farms, oil, industries, banks, and the rest are the common property of the nation, that is, of Scottish people as a whole. Our class, the working class, has created all of the wealth in the world today. All the food has been harvested by workers, every structure standing was built by workers, every mile travelled is on roads laid down by workers, the trillions of bits of data that make up the reality of contemporary commerce, education, and entertainment travel on are enabled by the silicone chips and optical fibers made by workers, keyed into worker-constructed networks by workers. All of these are the creation of the hands and minds of working people and it is our right to claim them as our own. How can it be that working people go hungry, lack adequate housing, lack transport, are denied information, education, and the means to live a life of quality, when all of these things are the creation of our class? Comrades, it is long past time we be done with the system of capitalism and take back what is rightfully ours. Their joy and their pride. Has come hame tae the Clyde.